In the previous blogs we provided some basic definitions for competencies and competency-based talent management. We also discussed the importance of defining an architecture or blueprint for defining your competency framework that will ensure the success of your competency framework in both the short and long term. In this blog we will examine the whole process of defining Job Competency Profiles according to the Competency Architecture that you have defined, and the key decisions that you will need to make. A competency profile specifies the competencies and levels of proficiency that are required for successful job performance for each job in your organization. The different layers and types of competencies incorporated within the Job Competency Profile will be dictated by your competency architecture. Using the competency architecture shown in the previous blog, the competency layers could include: Core Competencies; Job Family Competencies; as well as Job Specific Competencies. Depending on the job, Leadership competencies could also be incorporated. To help ensure that competency profiles are easy to use, best practice organizations limit the number of competencies included in each profile to around 12 competencies. 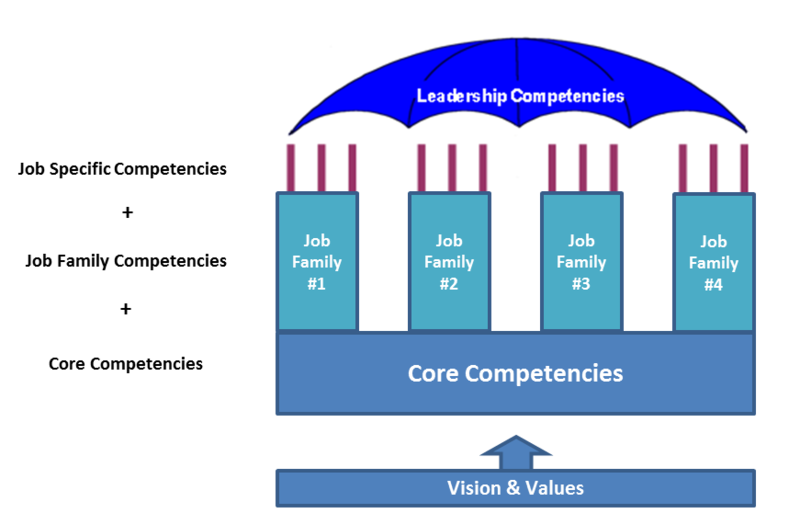 For example, an organization might choose to have 12 competencies per profile: 3 core competencies, 5 to 6 job family competencies, and 3 to 4 technical competencies. Here's a sample profile to illustrate this concept. The more uniform the work of a particular job group, the greater the chances that a limited number of competency profiles can be applied within that group. The less uniform the work, the greater the potential need for a variety of job competency profiles. Are there any job families that are not associated with one specific functional organizational area (e.g., Administrative Support) as opposed to ones that are (e.g., Finance)? What types of competencies will be included in a profile? How many competencies will each profile contain? How many competencies of each type will be included in the profile? Can general or technical competencies differ across roles in the same job group? Do individuals in leadership positions require leadership competencies in addition to, or instead of Job Family competencies?" Holding expert panels—using a card sort exercise or critical incident brainstorm: Expert panels are groups of individuals who know and understand the job or jobs within a job family, and represent the interests of the whole job group. They are trusted by the organization, representative of the whole job family (e.g., geography; organizational area; etc.) and good job performers. The group is led through a structured competency profiling / job analysis process by an expert in job competency profiling with the focus on the identification of the key competencies at the proficiency levels required. There various structured techniques that can be used (e.g., voting; card sorts; critical incident; etc. ), but the focus is always to get the group to come to a consensus on the key competencies required for success in the job or job group. Conducting surveys—asking job incumbents and supervisors to identify key competencies: Surveys are often employed in situations where there are a large number of employees within a job group or job family, and the organization wishes to ensure that a cross-representative sample of employees or supervisors is polled. The results are compiled and often reviewed by Expert Panels to establish the Job Competency Profiles. This approach is also used in situations where the employees may be widely dispersed geographically, such as in a global company. Conducting behavioral event interviews—using responses to interview questions to elicit competencies: This is an in-depth approach to exploring the competency requirements of jobs by conducting interviews with job holders and / or their supervisors, asking them to provide specific examples of events that either resulted in either highly successful or unsuccessful performance. The questions are typically structured to gather information about the anticipated competencies needed in the job. The results of the interviews are coded according to the competencies and proficiency levels needed for effective performance. This approach is more labour intensive and typically used when there are not many employees performing in the job – e.g., executive level positions. Reviewing worker materials and outputs—usually in combination with another method: This approach provides information about the complexity of the tasks involved in the job and the types of skills / abilities that may be needed (e.g., Attention to Detail; particular Technical / Professional Competencies). As noted, this technique is most often used in combination with other methods. Will you need to customize the profiles provided in the CompetencyCore framework to address the range of jobs and culture of your organization? Will core competencies need to be identified; if so, how, with whose input and at what point in the process? What methodology will be used for developing and validating profiles? Is broader consultation required beyond an expert panel? If so, how much consultation, with whom, and through what vehicle? How will senior management be involved in providing input or approving results? Interviews, focus groups, e-mail questionnaire? One of the key requirements for a successful competency initiative is ensuring that effective project management, communications and change management strategies and techniques are used throughout the development and implementation process. The next blog addresses this topic. the remaining part I care for such information much. I found it much useful, the ideas, information and regarded points have been described here are of the most importance to me, I'd also like to add it to my catalogs as well. Check college paper for best papers.